I finally had a chance on Thursday to get out of the house and hit a few thrift stores. It seems like I have been cooped up in this house FOREVER. Between the whole ankle thing, the holidays and my computer woes, thrifting just hadn’t been a priority. But I was missing it. Man, was I missing it. Thrifting is like an addiction. Except it’s legal and you don’t end up with a bad tattoo after a wild night on the town. Although you may end up with some questionable purchases. So off I go to the local thrift to check out what I’ve been missing. It appears I haven’t been missing much! There is no Christmas of any kind to be found in the store. I had hoped that some little old ladies had dropped off some of their Shiny Brite ornaments after the holidays, but if they had, the thrift store people have boxed it all up for next year. And a lot of the shelves are bare. I probably just missed the monthly 50% sale or something, because it is looking too darn empty in here. The one bright spot of the store is the toy section. It is jam packed full. I’m not normally a toy thrifter, because basically it’s just broken V-Tech toys or GI Joes with missing hands. I’m all for helping out a vet in need, but I’ll save my compassion for the non-plastic variety. But I decide to check it out and see if there is anything fun in there. I’m walking along checking out the toy stash and notice my shoe is untied. I bend down to tie it and I am face to face with the hanging goodie bags. An original 1959 Barbie . . . the Holy Grail of dolls. I try to play it cool. Breathe, Pam. Just breathe. I randomly grab a milk glass vase, so as to not draw attention to the fact that I am walking to the counter with a doll worth THOUSANDS. And I’m going to pay $1.91 for it (damn you Volunteers Of America for your weird pricing, what’s wrong with $1.95 or $1.99?). I manage to saunter up to the check-out desk, casually lay down my FREAKING FIND OF THE CENTURY and patiently wait for the woman to ring me up. But she doesn’t, so I quickly pay for my two items and walk out the door before anyone can stop me. I made it! I have found her! I am rolling in the dough!!! I didn’t have my glasses on in the store, so I couldn’t analyze her, but when I got out the car and put my glasses on I noticed that her back was stamped with the date . . . 1959. It was the reproduction “original” Barbie that Mattel sold in the 90’s. Goodbye, fancy new computer. Goodbye, trip to Hawaii. It was nice dreaming about you. You are so funny….and you tell a great story too…thanks for the laugh ….have a yourself a wonderful day! Sorry to hear of your problems and your ankle. I think Mercury is about to go retrograde if it hasn’t yet. Before Christmas I twisted my knee and for 3 weeks it still was hurting to go up and down the steps. So I sure can understand what you went through. We (my sister & I) had the original Barbie from 1959 with her stripped bathing suit too as my sister and I either shared our dolls or sometimes we got our own. (we had to share Ken and that caused some fights when it came to where Ken was to sleep at night). But I was told……if I had the stand that she was propped up on in the box and had the original box to. But my reason for posting a reply is I had that vintage Barbie and some of the blue dye from her pierce earrings got on her face which I read is common. She was in good shape, had the original pony tail still nicely groomed, no hacking off of her bangs, but I had to buy this cream for $65 that would remove the blue dye that was on her face if I was planning to sell. So I did the investment and it worked well. Now I too thought the bidding for our Vintage Blonde lady would bring us some nice money and maybe just maybe I could get $2000. Well as I was told by many and what I did read was since I had neither the stand or the original box, the most I ended up getting for our Vintage Barbie was $60. Actually after the investment of the cream to remove the dolls flaws, I was in the red for $5. I can relate to the disappointment! Still that doesn’t stop us, you and many others of finding that buried treasure! Oh, no. Losing $5 on the deal doesn’t sound so good 🙂 I would imagine not very many people would have the original box left anyhow. No one kept that sort of thing back then! Your post made me smile today. I was born the same year as Barbie and have an original 1958 Barbie. She is not in her original box and has been played with many times through out her 58 years so not sure she is worth too much. Just love having a barbie that was born the same year as I was. Have a great week end. I could SO relate! Great photos and great story! I have an original-in-box Midge from, I think, 1961- same eyeliner and stuff. How fun! I remember Midge and Skipper (little sister???). It used to be that we had one or two dolls and collected lots of Barbie clothes, now I think the little girls just have hundreds of different Barbies them with different outfits on each one. Oh gosh! You had me going there! Great post! You know – I had that Barbie. I saved it in my treasure box for years. One day my niece found it and brought it downstairs. My mother GAVE it to her! She immediately cut off her ponytail! Can you believe it!? Our poor barbies. Most of mine were drug by a rope behind my brother’s horse. I don’t know why he liked to torture my sister and I like that! Oh, no! Poor, poor Barbies! But,t hat JEEP though. SO dang cool. Never was a Barbie girl myself. I had some and the vehicles and such. But, I preferred the Sunshine Family for some reason. Glad you got to get out and didn’t get into too much trouble! LOL I’ve done the same thing – just knew I’d found a real treasure and then get home and doing some checking to find it’s not as valuable as I thought. Oh well, it was a thrill for a while. Enjoyed your post today! So sorry you’re not living on Easy Street counting your moolah, Pam. :o( On the bright side, you could bake one of those birthday cakes with Barbie standing in the middle and the cake as her hoop skirt…..yummy pink marshmallow frosting…. I’ve still got my original 4 Barbie dolls that I thought would be worth millions, too. I never let my girls play with them unattended, but now I see the error of my ways, and our oldest granddaughter has been quite entertained by them…..especially the big boobies. hehe She doesn’t see much of that in our extended family. Here’s to better shopping at the thrift in the months to come! I had totally forgotten about the cakes!!! I had one when I was seven! I’ll have to find that photo. Well at least you had that moment when you thought she was the real deal! I tbink I even had a Sunshine Family. 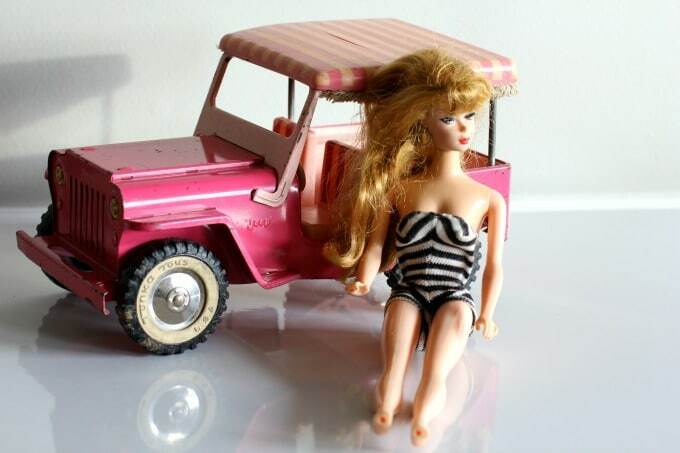 Have fun with Barbie and her jeep. You never cease to crack me up, Pam! Better luck next time. I would have been fooled too and I actually owned the original Barbie when she came out (yes, I’m that old. LOL) I wish I still had her. 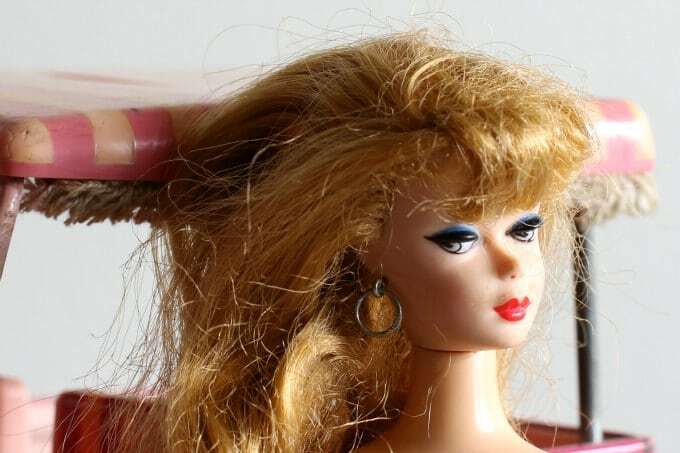 I sure wish I had my Auburn bubble cut Barbie, and Midge, and Ken, and Skipper, and Scooter…but no, I sold them at a garage sale when I was 12. Cool find. If her eyebrows are curved instead of arched, she’s worth more.